Our pick-up rate structure is based on zip code, so please e-mail us for a price quote. You can also call 305.636.1911 or toll-free 1.800.451.2204 or fax us at 305.694.5136. In order to accurately assess manpower and equipment required for on-site pick-up, we need to know location details, i.e. is it at ground or upper floor, vehicle access restrictions, building vendor access requirement and insurance, desired time and day of pick-up. 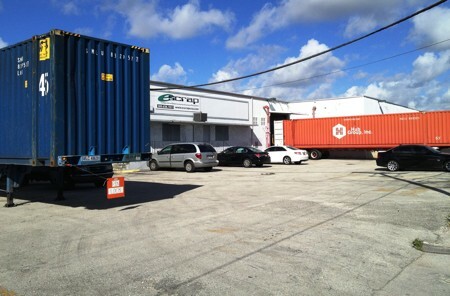 Monday - Friday, 8:30 a.m. to 12:00 Noon and 12:30 p.m. to 4:00 p.m.
Will load 20' or 40'+ buyer-booked ocean container in line with buyer's instructions; charges may apply in line with rates shown in Ocean Container Loading Rates.